Looking for a weekend project? Like pickles? This is the post for you. Also, if the following video is the first thing you think of when someone talks about making homemade pickles, we should probably be friends. For my pickle project, I modified this recipe from The Kitchn as follows. Wash your jars and lids. I made refrigerator pickles, so I didn’t sterilize for long-term storage. If you’d like to go for pickles that will stand the test of time, see the Kitchn’s instructions. Wash and trim your cucumbers, making sure to get rid of those stumpy ends. Slice them up according to your preference. I chose coins, because I thought they’d be easier to pack. I think I was right. 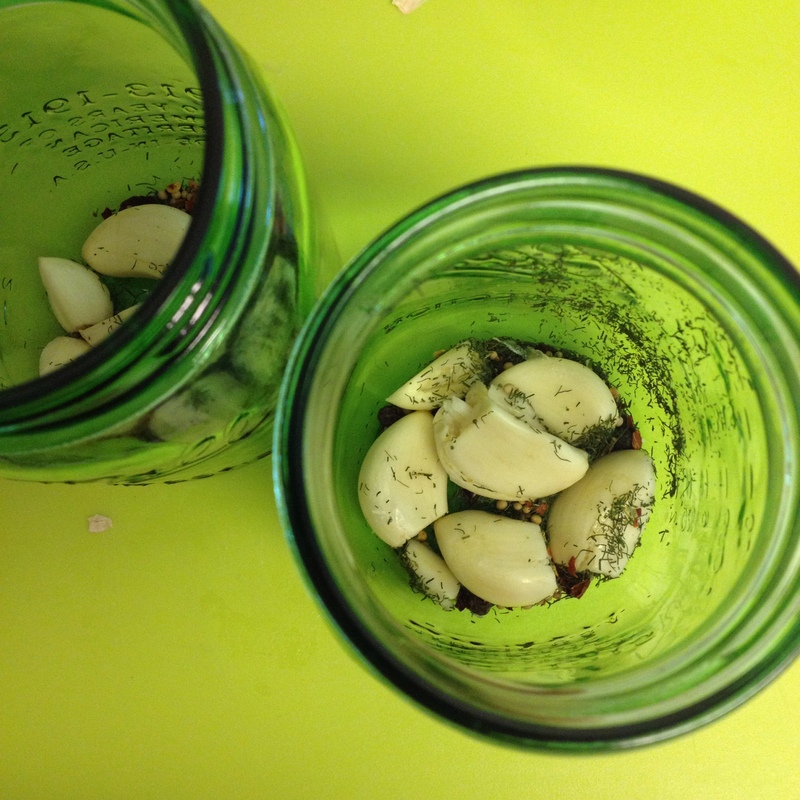 Divide your chosen garlic and spices equally between your two jars. Pack your jars with those soon-to-be-pickles. Boil your brine. Bring the vinegar, water and salt to a boil in a sauce pan. 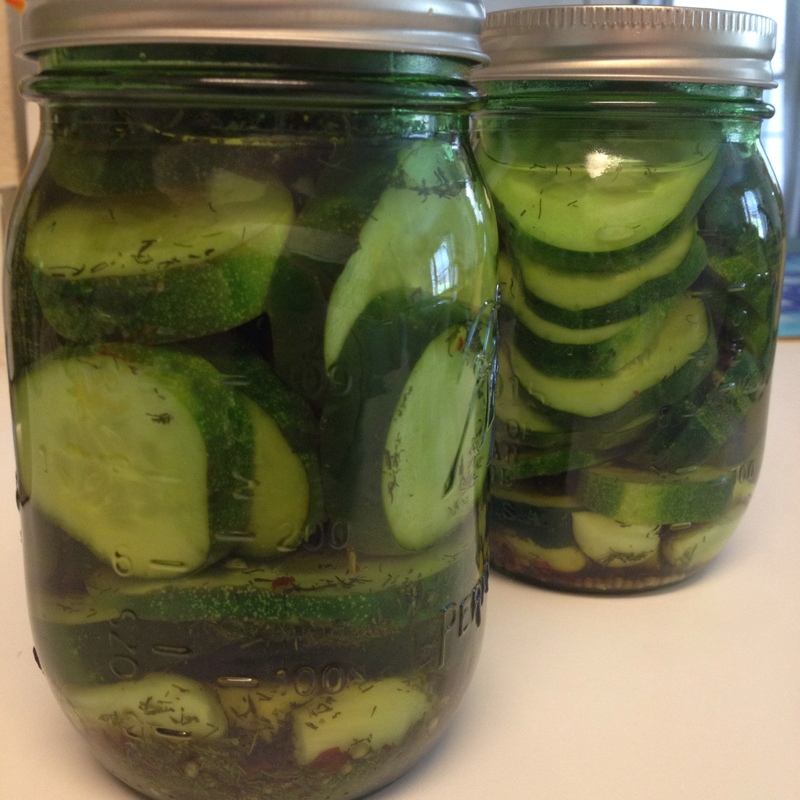 Pour the boiled brine over your pickles, making sure to cover the tops of the cucumbers (but not so full to spill). I increased the brine ingredients above, because the original recipe didn’t have quite enough for my thirsty pickles. Tap the jars to remove air bubbles before tightening those lids! Let the jars cool, then refrigerate. I waited a week before opening mine. They should keep in the refrigerator for a few weeks. Notes: I couldn’t find dill seed at my local supermarket, and I didn’t feel like trekking to Whole Foods. Dill seed is recommended in every recipe I found, but *spoiler alert* my pickles turned out just fine with dill weed. End result? Slightly vinegar-y, crispy pickles. Plus, I felt like a homesteader/hipster for a little while. You can pickle that!